Calling all crafty and creative Popcorn Palace Tweeps! Are you culinarily inclined? Gastronomically gifted? Put your genius to the test in our Create a New Flavor Twitter Contest. Between now and 5:00 p.m. CT, Monday, January 28, 2013, tweet your most adventurous, creative, and delicious flavor ideas to #PopFlav. We’ll announce the winning entry by Tuesday, January 29. The winner will receive a $25 credit to the Popcorn Palace online store! – Entries must include #PopFlav to be accepted. – Contest ends Monday, January 28, 2013 at 5:00 p.m. CT.
– Winner will be selected by a Popcorn Palace judge based on creativity and culinary appeal, and will be announced on or before Tuesday, January 29, 2013 at 5:00 p.m. CT.
– Winner will be notified via Twitter Direct Message. Once notified, winner is responsible for responding with their email addresses and phone number. -Popcorn Palace assumes no liability or responsibility for any problems or technical malfunction of any telephone network or telephone lines, computer on-line systems, servers, or providers, computer equipment, software, human error or traffic congestion on the Internet or at any Web site, or any combination thereof, or technical or human error which may occur in the processing of entries. 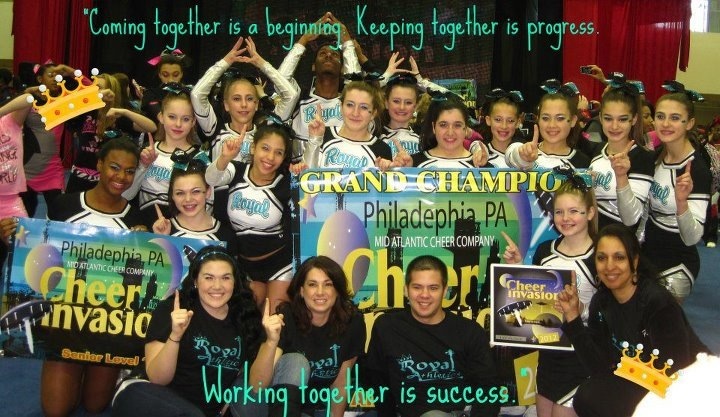 Royal Athletics All Stars is a non-profit organization that teaches the sport of competitive cheerleading & body conditioning for healthy bodies. They also emphasize fundraising so everyone who wishes to participate has a chance to participate. The program attracts dedicated athletes from all over the area. They come together, mostly as strangers, and unite as one family doing something they love. The best part is that they create lasting bonds and memories. The Royal Athletics All Stars are beaming with pride as their team took first place in their division and overall grand champion in their level!